For ICM classifications, see the image below. Classification of iodinated contrast agents by their molecular structures. High-osmolality contrast media consist of a tri-iodinated benzene ring with 2 organic side chains and a carboxyl group. The iodinated anion, diatrizoate or iothalamate, is conjugated with a cation, sodium or meglumine; the result is an ionic monomer (see the image below). The ionization at the carboxyl-cation bond makes the agent water soluble. Thus, for every 3 iodine atoms, 2 particles are present in solution (ie, a ratio of 3:2). The osmolality in solution ranges from 600 to 2100 mOsm/kg, versus 290 mOsm/kg for human plasma. The osmolality is related to some of the adverse events of these contrast media. Ionic monomers are subclassified by the percentage weight of the contrast agent molecule in solution (eg, 30% or 76%). In the United States, commonly used high-osmolality ICM are Renografin (diatrizoate anion; Bracco Diagnostics Inc, Princeton, NJ ) or Hypaque (diatrizoate anion; GE Healthcare, Inc, Princeton, NJ) and Conray (iothalamate anion; tyco Healthcare and Mallinckrodt Inc, St. Louis, Mo). 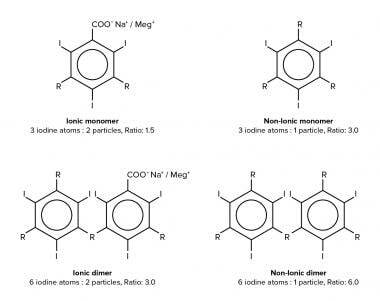 There are 3 types of low-osmolality ICM: (1) nonionic monomers, (2) ionic dimers, and (3) nonionic dimers. In nonionic monomers, the tri-iodinated benzene ring is made water soluble by the addition of hydrophilic hydroxyl groups to organic side chains that are placed at the 1, 3, and 5 positions. Lacking a carboxyl group, nonionic monomers do not ionize in solution. Thus, for every 3 iodine atoms, only 1 particle is present in solution (ie, a ratio of 3:1). Therefore, at a given iodine concentration, nonionic monomers have approximately one half the osmolality of ionic monomers in solution. At normally used concentrations, 25-76%, nonionic monomers have 290-860 mOsm/kg. Nonionic monomers are subclassified according to the number of milligrams of iodine in 1 mL of solution (eg, 240, 300, or 370 mg I/mL). The larger side chains increase the viscosity of nonionic monomers compared with ionic monomers. The increased viscosity makes nonionic monomers harder to inject, but it does not appear to be related to the frequency of adverse events. Common nonionic monomers are iohexol (Omnipaque; GE Healthcare, Inc), iopamidol (Isovue; Bracco Diagnostics Inc), ioversol (Optiray; tyco Healthcare and Mallinckrodt Inc), and iopromide (Ultravist; Bayer HealthCare Pharmaceuticals Inc, Wayne, NJ). The nonionic monomers are the contrast agents of choice. In addition to their nonionic nature and lower osmolalities, they are potentially less chemotoxic than the ionic monomers. Ionic dimers are formed by joining 2 ionic monomers and eliminating 1 carboxyl group. These agents contain 6 iodine atoms for every 2 particles in solution (ie, a ratio of 6:2). The only commercially available ionic dimer is ioxaglate (Hexabrix; tyco Healthcare and Mallinckrodt Inc). Ioxaglate has a concentration of 59%, or 320 mg I/mL, and an osmolality of 600 mOsm/kg. Because of its high viscosity, ioxaglate is not manufactured at higher concentrations. Ioxaglate is used primarily for peripheral arteriography. Nonionic dimers consist of 2 joined nonionic monomers. These substances contain 6 iodine atoms for every 1 particle in solution (ie, ratio of 6:1). For a given iodine concentration, the nonionic dimers have the lowest osmolality of all the contrast agents. At approximately 60% concentration by weight, these agents are iso-osmolar with plasma. They are also highly viscous and, thus, have limited clinical usefulness. Examples of nonionic dimers are iotrol and iodixanol (Visipaque; Amersham Health Inc, Princeton, NJ). The incidence of any adverse reaction to ICM is about 15%. Most of these reactions are mild and require no treatment. Dillman et al performed a retrospective review of 11,306 children (age 24 </ref>Overall, the authors found that 0.18% of the children had acute allergic-like reactions to the contrast agent; of the affected patients, 80% of the reactions were categorized as mild, 5% as moderate, and 15% as severe. A meta-analysis of the published data from 1980-1989 by Caro et al revealed that the risk of severe adverse reaction was 0.157% for high-osmolality ICM and 0.031% for nonionic ICM. The investigators found that the risk of death was 1 death in 100,000 patients with either type of agent. Other reports indicate that low-osmolality agents are somewhat less nephrotoxic in patients with azotemia than in other patients. Nonionic ICM are less likely than conventional ionic ICM to cause tissue damage when they are extravasated. Nonetheless, compartment syndromes and skin blistering are reported after the extravasation of nonionic agents. Some toxic effects of ICM, such as nausea and vomiting, are more common with ionic dimers than with nonionic monomers. Most authorities believe that the preponderance of evidence that supports the lower rate of adverse reactions with low-osmolality ICM compared with high-osmolality ICM is conclusive. The reason that low-osmolality ICM have not completely replaced the older high-osmolality ICM is the higher cost of the low-osmolality agents. Professional organizations have formulated guidelines regarding the selective use of low-osmolality ICM for certain high-risk patients. However, with the selective use of nonionic ICM, severe adverse contrast reactions are 3 times as likely in low-risk patients who receive conventional ionic agents (0.09%) than in high-risk patients who receive nonionic agents (0.03%). Thus, the single most important risk factor for an adverse reaction is the type of contrast agent that is chosen for injection. [Guideline] American College of Radiology. ACR Manual on Contrast Media v10.3. 2017. Available at https://www.acr.org/~/media/37D84428BF1D4E1B9A3A2918DA9E27A3.pdf. Dillman JR, Ellis JH, Cohan RH, Strouse PJ, Jan SC. Allergic-like breakthrough reactions to gadolinium contrast agents after corticosteroid and antihistamine premedication. AJR Am J Roentgenol. 2008 Jan. 190(1):187-90. [Medline]. Dillman JR, Ellis JH, Cohan RH, Strouse PJ, Jan SC. Frequency and severity of acute allergic-like reactions to gadolinium-containing i.v. contrast media in children and adults. AJR Am J Roentgenol. 2007 Dec. 189(6):1533-8. [Medline]. Goel G, Ravishankar S, Jayakumar PN, et al. Intrathecal gadolinium-enhanced magnetic resonance cisternography in cerebrospinal fluid rhinorrhea: road ahead?. J Neurotrauma. 2007 Oct. 24(10):1570-5. [Medline]. Kalogeromitros DC, Makris MP, Rouvas A, et al. Skin testing and adverse reactions in fluorescein: a prospective study. Allergy Asthma Proc. 2007 Jul-Aug. 28(4):472-6. [Medline]. Lira RP, Oliveira CL, Marques MV, et al. Adverse reactions of fluorescein angiography: a prospective study. Arq Bras Oftalmol. 2007 Jul-Aug. 70(4):615-8. [Medline]. [Full Text]. Thomsen HS. Imaging patients with chronic kidney disease: CIN or NSF?. Radiol Med (Torino). 2007 Aug. 112(5):621-5. [Medline]. Thomsen HS, Marckmann P, Logager VB. Nephrogenic systemic fibrosis (NSF): a late adverse reaction to some of the gadolinium based contrast agents. Cancer Imaging. 2007. 7:130-7. [Medline]. [Full Text]. Tubek S, Tubek I. Significance of zinc in nephrotoxicity of contrast media used in imaging diagnostics of the cardiovascular system. Biol Trace Elem Res. 2007. 117(1-3):1-5. [Medline]. Lightfoot CB, Abraham RJ, Mammen T, Abdolell M, Kapur S, Abraham RJ. Survey of radiologists' knowledge regarding the management of severe contrast material-induced allergic reactions. Radiology. 2009 Jun. 251(3):691-6. [Medline]. Callahan MJ, Poznauskis L, Zurakowski D, Taylor GA. Nonionic iodinated intravenous contrast material-related reactions: incidence in large urban children's hospital--retrospective analysis of data in 12,494 patients. Radiology. 2009 Mar. 250(3):674-81. [Medline]. Pan JJ, Draganov PV. Adverse reactions to iodinated contrast media administered at the time of endoscopic retrograde cholangiopancreatography (ERCP). Inflamm Allergy Drug Targets. 2009 Mar. 8(1):17-20. [Medline]. Brockow K, Romano A, Aberer W, Bircher AJ, Barbaud A, Bonadonna P, et al. Skin testing in patients with hypersensitivity reactions to iodinated contrast media - a European multicenter study. Allergy. 2009 Feb. 64(2):234-41. [Medline]. Mruk B. Renal Safety of Iodinated Contrast Media Depending on Their Osmolarity - Current Outlooks. Pol J Radiol. 2016. 81:157-65. [Medline]. Bucher AM, De Cecco CN, Schoepf UJ, et al. Is Contrast Medium Osmolality a Causal Factor for Contrast-Induced Nephropathy?. Biomed Research International. Available at http://www.ncbi.nlm.nih.gov/pmc/articles/PMC3988854/. 2014; Accessed: May 31, 2016. Gaca AM, Frush DP, Hohenhaus SM, et al. Enhancing pediatric safety: using simulation to assess radiology resident preparedness for anaphylaxis from intravenous contrast media. Radiology. 2007 Oct. 245(1):236-44. [Medline]. Cutroneo P, Polimeni G, Curcuruto R, Calapai G, Caputi AP. Adverse reactions to contrast media: an analysis from spontaneous reporting data. Pharmacol Res. 2007 Jul. 56(1):35-41. [Medline]. Cohan RH, Ellis JH. Iodinated contrast material in uroradiology. Choice of agent and management of complications. Urol Clin North Am. 1997 Aug. 24(3):471-91. [Medline]. Cohan RH, Ellis JH, Dunnick NR. Use of low-osmolar agents and premedication to reduce the frequency of adverse reactions to radiographic contrast media: a survey of the Society of Uroradiology. Radiology. 1995 Feb. 194(2):357-64. [Medline]. [Full Text]. Marshall GD Jr, Lieberman PL. Comparison of three pretreatment protocols to prevent anaphylactoid reactions to radiocontrast media. Ann Allergy. 1991 Jul. 67(1):70-4. [Medline]. Katayama H, Yamaguchi K, Kozuka T, et al. Adverse reactions to ionic and nonionic contrast media. A report from the Japanese Committee on the Safety of Contrast Media. Radiology. 1990 Jun. 175(3):621-8. [Medline]. [Full Text]. Lasser EC, Berry CC, Talner LB, et al. Pretreatment with corticosteroids to alleviate reactions to intravenous contrast material. N Engl J Med. 1987 Oct 1. 317(14):845-9. [Medline]. Wolf GL, Arenson RL, Cross AP. A prospective trial of ionic vs nonionic contrast agents in routine clinical practice: comparison of adverse effects. AJR Am J Roentgenol. 1989 May. 152(5):939-44. [Medline]. [Full Text]. Dillman JR, Strouse PJ, Ellis JH, Cohan RH, Jan SC. Incidence and severity of acute allergic-like reactions to i.v. nonionic iodinated contrast material in children. AJR Am J Roentgenol. 2007 Jun. 188(6):1643-7. [Medline]. Caro JJ, Trindade E, McGregor M. The risks of death and of severe nonfatal reactions with high- vs low-osmolality contrast media: a meta-analysis. AJR Am J Roentgenol. 1991 Apr. 156(4):825-32. [Medline]. [Full Text]. Kinnison ML, Powe NR, Steinberg EP. Results of randomized controlled trials of low-versus high-osmolality contrast media. Radiology. 1989 Feb. 170(2):381-9. [Medline]. [Full Text]. Memolo M, Dyer R, Zagoria RJ. Extravasation injury with nonionic contrast material [letter]. AJR Am J Roentgenol. 1993 Jan. 160(1):203-4. [Medline]. [Full Text]. Foord KD, Kaye B, Howard J, Cumberland DC. Comparison of the side-effects of low-osmolar contrast media in intravenous urography. Clin Radiol. 1985 Jul. 36(4):379-80. [Medline]. Bush WH, Swanson DP. Acute reactions to intravascular contrast media: types, risk factors, recognition, and specific treatment. AJR Am J Roentgenol. 1991 Dec. 157(6):1153-61. [Medline]. [Full Text]. Becker C. [Prophylaxis and treatment of side effects due to iodinated contrast media relevant to radiological practice] [German]. Radiologe. 2007 Sep. 47(9):768-73. [Medline]. Iakovou I, Zapandiotis A, Mpalaris V, Goulis DG. Radio-contrast agent-induced hyperthyroidism: case report and review of the literature. Arch Endocrinol Metab. 2016 Feb 16. [Medline]. Andreucci M, Solomon R, Tasanarong A. Side Effects of Radiographic Contrast Media: Pathogenesis, Risk Factors, and Prevention. BioMed Research International. Available at http://www.hindawi.com/journals/bmri/2014/741018/. 2014; Accessed: May 31, 2016. Hudzik B, Zubelewicz-Szkodzińska B. Radiocontrast-induced thyroid dysfunction: is it common and what should we do about it?. Clin Endocrinol (Oxf). 2014 Mar. 80 (3):322-7. [Medline]. [Full Text]. Davis PL. Anaphylactoid reactions to the nonvascular administration of water-soluble iodinated contrast media. AJR Am J Roentgenol. 2015 Jun. 204 (6):1140-5. [Medline]. Brockow K, Sánchez-Borges M. Hypersensitivity to contrast media and dyes. Immunol Allergy Clin North Am. 2014 Aug. 34 (3):547-64, viii. [Medline]. Egbert RE, De Cecco CN, Schoepf UJ, McQuiston AD, Meinel FG, Katzberg RW. Delayed adverse reactions to the parenteral administration of iodinated contrast media. AJR Am J Roentgenol. 2014 Dec. 203 (6):1163-70. [Medline]. Barr ML, Chiu HK, Li N, Yeh MW, Rhee CM, Casillas J, et al. Thyroid Dysfunction in Children Exposed to Iodinated Contrast Media. J Clin Endocrinol Metab. 2016 Mar 28. jc20161330. [Medline]. Azzalini L, Spagnoli V, Ly HQ. Contrast-Induced Nephropathy: From Pathophysiology to Preventive Strategies. Can J Cardiol. 2015 May 23. [Medline]. Nicola R, Shaqdan KW, Aran K, Mansouri M, Singh A, Abujudeh HH. Contrast-Induced Nephropathy: Identifying the Risks, Choosing the Right Agent, and Reviewing Effective Prevention and Management Methods. Curr Probl Diagn Radiol. 2015 Apr 15. [Medline]. Balemans CE, Reichert LJ, van Schelven BI, van den Brand JA, Wetzels JF. Epidemiology of Contrast Material-induced Nephropathy in the Era of Hydration. Radiology. 2012 Jun. 263(3):706-13. [Medline]. Rose TA Jr, Choi JW. Intravenous Imaging Contrast Media Complications: The Basics That Every Clinician Needs to Know. Am J Med. 2015 Sep. 128 (9):943-9. [Medline]. Mammarappallil JG, Hiatt KD, Vincent W, Bettmann MA. How accurate is the label "allergic to iodinated contrast agents"?. Acta Radiol. 2016 Jan. 57 (1):47-50. [Medline]. Sesé L, Gaouar H, Autegarden JE, Alari A, Amsler E, Vial-Dupuy A, et al. Immediate hypersensitivity to iodinated contrast media: diagnostic accuracy of skin tests and intravenous provocation test with low dose. Clin Exp Allergy. 2016 Mar. 46 (3):472-8. [Medline]. Subramaniam RM, Wilson RF, Turban S, Suarez-Cuervo C, Zhang A, Sherrod C, et al. Contrast-Induced Nephropathy: Comparative Effects of Different Contrast Media. 2016 Jan. [Medline]. [Full Text]. Subramaniam RM, Suarez-Cuervo C, Wilson RF, Turban S, Zhang A, Sherrod C, et al. Effectiveness of Prevention Strategies for Contrast-Induced Nephropathy: A Systematic Review and Meta-analysis. Ann Intern Med. 2016 Mar 15. 164 (6):406-16. [Medline]. Eng J, Subramaniam RM, Wilson RF, Turban S, Choi MJ, Zhang A, et al. 2015 Dec. [Medline]. [Full Text]. John M. Eisenberg Center for Clinical Decisions and Communications Science. Contrast-Induced Nephropathy (CIN): Current State of the Evidence on Contrast Media and Prevention of CIN. 2007. [Medline]. [Full Text]. [Guideline] European Society of Urogenital Radiology. ESUR Guidelines on Contrast Media. European Society of Urogenital Radiology.2015. Available at http://www.esur.org/guidelines/. Accessed: September 29, 2015. [Guideline] Royal College of Radiology. Standards for intravascular contrast administration to adult patients, 3rd edition. Available at https://www.rcr.ac.uk/publication/standards-intravascular-contrast-administration-adult-patients-third-edition. Davenport MS, Cohan RH, Ellis JH. Contrast media controversies in 2015: imaging patients with renal impairment or risk of contrast reaction. AJR Am J Roentgenol. 2015 Jun. 204 (6):1174-81. [Medline]. Mervak BM, Davenport MS, Ellis JH, Cohan RH. Rates of Breakthrough Reactions in Inpatients at High Risk Receiving Premedication Before Contrast-Enhanced CT. AJR Am J Roentgenol. 2015 Jul. 205 (1):77-84. [Medline]. Davenport MS, Cohan RH, Caoili EM, Ellis JH. Repeat contrast medium reactions in premedicated patients: frequency and severity. Radiology. 2009 Nov. 253(2):372-9. [Medline]. Kolbe AB, Hartman RP, Hoskin TL, Carter RE, Maddox DE, Hunt CH, et al. Premedication of patients for prior urticarial reaction to iodinated contrast medium. Abdom Imaging. 2014 Apr. 39(2):432-7. [Medline]. Greenberger PA, Patterson R, Radin RC. Two pretreatment regimens for high-risk patients receiving radiographic contrast media. J Allergy Clin Immunol. 1984 Oct. 74(4 pt 1):540-3. [Medline]. United States Food and Drug Administration. New warnings required on use of gadolinium-based contrast agents. US Food and Drug Administration. Available at http://www.fda.gov/NewsEvents/Newsroom/PressAnnouncements/ucm225286.htm. Accessed: September 9, 2010. Tepel M, Zidek W. Acetylcysteine and contrast media nephropathy. Curr Opin Nephrol Hypertens. 2002 Sep. 11(5):503-6. [Medline]. Shehadi WH. Adverse reactions to intravascularly administered contrast media. A comprehensive study based on a prospective survey. Am J Roentgenol Radium Ther Nucl Med. 1975 May. 124(1):145-52. [Medline]. Jensen N, Dorph S. Adverse reactions to urographic contrast medium. Rapid versus slow injection rate. Br J Radiol. 1980 Jul. 53(631):659-61. [Medline].